Subaru doesn’t want Tom Brady to win Super Bowl LII. They are Eagles fans first. Subaru of America won’t be cheering for Tom Brady and the Patriots when they square off with the Eagles on February 4 for Super Bowl LII. Not many people probably caught it, but Subaru has an image of the new 2019 Ascent 3-Row vehicle with an Eagles head and band equipment in the back of the family hauler. Subaru is moving into their new digs in Camden, N.J. soon which is just 4.9 miles away from Philadelphia, and Subaru will be cheering for their local team to win. You might even see an Eagles banner on their new building not far from the Eagles stadium. Subaru of America (SOA) and its employees have been Eagles fans for a long time as they’ve had their home in the Delaware Valley since its 1968 founding in Bala Cynwyd, PA. The company has been at its current Cherry Hill, NJ, site since 1986, and the new digs in Camden are almost ready. Next month will mark 50 years in the U.S., and they have big celebrations planned. 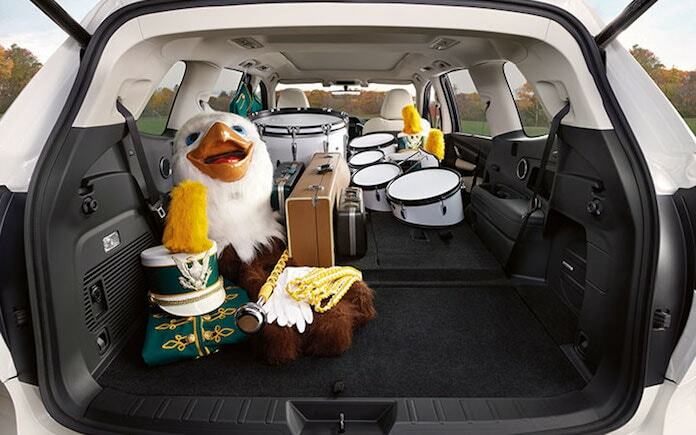 They'd also like to celebrate an Eagles Super Bowl win at the same time they bring the all-new Ascent 3-Row family hauler to Philadelphia. Subaru has long been involved in the Philadelphia area and just announced they will continue their sponsorship of the Philadelphia Flower Show for the 17th consecutive year. Subaru says they will bring their all-new 2019 Subaru Ascent to the show March 3-11, and it will be featured in an exhibit connecting the past with the future by incorporating a wooden tunnel bridge and river, with the brand’s first ever vehicle; the Subaru 360 and latest vehicle, the Subaru Ascent, on either side. Subaru hasn’t said much about wanting the Patriots to lose, but on a recent Facebook post, they said, “Our new headquarters is ready to cheer on our neighbors, and included the hashtag #FlyEaglesFly. The new building will house all of the company’s South Jersey employees, currently spread over a number of facilities, onto one campus. The new digs will likely be full of Eagles fans with many employees celebrating 30-plus years with the automaker. Subaru would like to uncover the 2019 Subaru Ascent at the Philadelphia Flower Show with an eagle head in the back, and Tom Brady losing to their local team. It would also be fitting for their 50th anniversary celebrations going on February 15, just 11 days after Super Bowl LII. LOL. Might be worth checking in to see who Subaru of New England is rooting for. Pretty sure SNE comes close to outselling the rest of SOA. Yup! SNE is not a dealer though. It is the unique regional distribution company that covers all of the 7 New England states. All the NE dealerships buy their cars not from Subaru of America, but rather Subaru of New England. The HQ is about 2 miles from Gillette and the owner of the company is a big football fan. SNE was the primary sponsor of the female pro football team for Boston, the Militia.